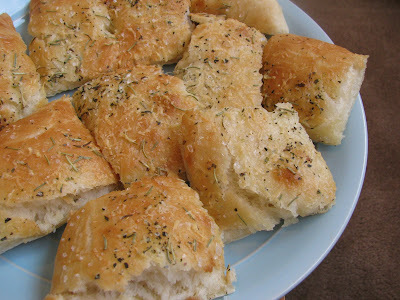 I love focaccia bread, and actually used to make it pretty frequently before I got married. The recipe I used then was an authentic Italian focaccia recipe, and it was yummy, but it took about 4 hours to make and dried out after about a day. A few months ago, I realized there was no reason I couldn't use my all-purpose dough to make a light and fluffy—and much faster to make—focaccia. The other night I put the idea to the test, and it was delicious—including the leftovers! I will definitely be repeating this. It's also a pretty healthy snack, since it's loaded with healthy oils and spices. Heat oven to 425. Grease cookie sheet. Make up one batch of pizza/breadstick dough according to recipe—you are aiming for a pretty soft dough here, so go easy on the flour. Knead minced garlic into bread dough. Coat dough with oil and let rise, covered, for about 15 minutes. Gently work dough onto greased cookie sheet, spreading evenly but not too thinly. Cover and let rise for another 20-30 minutes. Brush top of bread with olive oil; with fingers, press dimples into bread every 3-4 inches. Top with sea salt, rosemary, oregano, basil, and grated parmesan. Bake at 425 for 12-15 minutes or until golden brown. (Note: the second time I made this, I cooked it on the second oven rack instead of the highest rack out of necessity. It actually ended up making a FABULOUS crunchy artisan bottom crust... I think I will do it on that rack from now on!) Let cool for a few minutes; cut into squares and enjoy! When I saw your recipe blog on your green smoothie post, I was going to come ask you to post that tasty bread stuff you made, but IT'S ALREADY HERE!!!! :D My needs feel so anticipated!